SEDIMENTOLOGY—Experiments on lamination of sediments, resulting from a periodic graded-bedding subsequent to deposition—a contribution to the explanation of lamination of various sediments and sedimentary rocks. These sedimentation experiments have been conducted in still water with a continuous supply of heterogranular material. A deposit is obtained, giving the illusion of successive beds or laminae. These laminae are the result of a spontaneous, periodic and continuous grading process, which takes place immediately, following the deposition of the heterogranular mixture. The thickness of the laminae appears to be independent of the speed of sedimentation but increases with extreme differences in the size of the particles in the mixture. Where a horizontal current is involved, thin laminated superposed layers developing laterally in the direction of the current, are observed. However, Lombard also writes: ‘Kuenen (1966) has reproduced these laminae without any current pulsations. They are formed during decelerations.’5 Having read this, I wondered whether the presence of a current was necessary in the formation of laminae, and whether these laminae could not result just as well from a continuous sedimentation in still water. Figure 1. Laminations resulting from flowing of dry sediment. 1. A mixture was prepared consisting of 25% sand with particles ranging in size between 0.3 mm and 0.4 mm coloured with methylene blue, and 75 % siliceous powder with particles between 20 and 80 microns. Then, during a period of 10 minutes the dry mixture was poured into a 2 litre conical-shaped vessel. 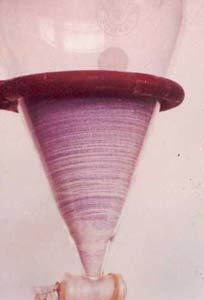 Figure 1 shows that an alluvium cone was formed in the vessel, as a result of the mixture having fallen into the vessel at a constant rate. Almost horizontal graded sequences appeared simultaneously at the bottom of the vessel, composed of blue sand underneath and siliceous powder of approximately 2.5 mm thickness on top. A striking parallel can be obtained by a dry flow of mixtures of powders.’6 These experiments show segregation of particles of the same size. 2. 5 kg of the same mixture was poured into the funnel of a screw powder distributor, which provides a continuous flow of the mixture at varying speeds into a 2 litre test tube full of water. 400 g of the mixture was poured into the test tube at a speed of 140 g per hour. A laminated deposit was obtained. The thickness of the laminae was practically constant at about 2.5 mm. A cross-section through the dry deposit showed the laminae. 3. In order to observe the lamination mechanism better, the previous experiment was repeated with the water being coloured with methylene blue. Figure 2 shows that the top part of the resultant deposit is clearer than the rest of the deposit. This top part forms a ring, composed mostly of siliceous powder, into which particles of blue sand can be seen to penetrate. As the ring grows thicker, a thin layer of blue sand appears within it. This constitutes the base of a new lamina. And so it goes on. The genesis of this lamination, therefore, results quite clearly from a segregation of particles of the same size within the deposited mixture. Graded bedding has occurred within the deposit itself, after its sedimentation. There is no superposition of layers. Figure 2. Laminations resulting from flowing in water. Does the speed of sedimentation cause a variation in the thickness of the laminae? Sand calibrated between 0.135 mm and 0.400 mm coloured with blue methylene, and a siliceous powder between 20 and 40 microns were used. 1. Variation in the sedimentation speed of siliceous powder. Successively, 50, 100, 200 and 300 cm3 of powder were diluted in a test tube full of water. The sedimentation time increased according to the increasing quantity of powder being diluted. Into each of these dilutions, the same 80 cm3 volume of sand flowed from the distributor during 5 minutes. The thickness of the resulting laminae remained constant at about 2.5 mm. 2. 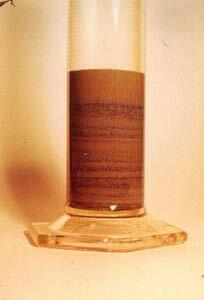 Variation in the sedimentation speed of sand. 40, 80 and 120 cm3 of sand were poured successively for 5 minutes into the same dilution of 200 cm3 of siliceous powder in 2 litres of water. The thickness of the resulting strata remained constant at about 2.5 mm. 3. 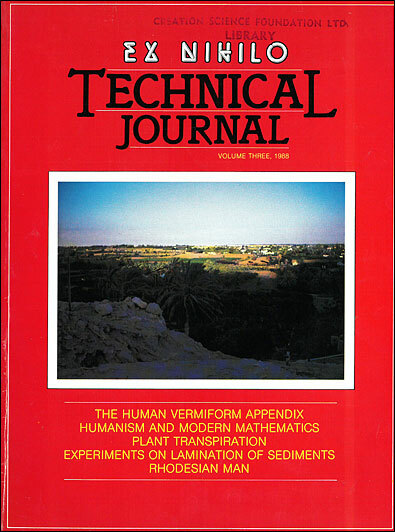 Simultaneous variations of the sedimentation speed of sand and siliceous powder. A mixture, composed of 25% sand and 75% siliceous powder, flowed from the distributor into the test tube full of water, at a speed of 140g per hour, then at double and triple this speed. Figure 3 shows that the thickness of the laminae remained constant. Figure 3. The thickness of laminae is independent of the speed of sedimentation. The obvious conclusion is that within experimental limits the thickness of laminae is independent of the sedimentation speed. Do laminae vary in thickness with extreme differences in the size of the particles? 1. Variation of thickness with the size of large particles of sand. 2. Variation in thickness due to the sizes of the siliceous powder particles. 3. Variation in thickness due to the wide difference in size of the particles of sand. Figure 4. The thickness of laminae is independent of the speed of sedimentation. Three further experiments with larger differences in size (1.25 mm–1.6 mm–2 mm) gave irregular lamination. The obvious conclusion from this second series of experiments is that the thickness of laminae increases with an increase in the difference between the size of the particles in them. Numerous fluviatile and marine sediments, as well as sedimentary rocks, showing the microstratified aspect are given such names as: laminae, laminites, varves, etc. These types of lamination are attributed to successive deposits of layers. The question is whether some of these natural laminae can be explained by the mechanism demonstrated above. In this connection the experimental method was applied to the following natural sedimentary rocks found in France. 1. A multicoloured sandstone from Fontainbleau shows lamination of an average of 3 mm thickness. It was crumbled into particles varying from 0.1 to 0.3 mm in size. The particles were placed in the distributor, and fed into the 2 litre test tube full of water at a speed of 50 g per hour. The original lamination was reproduced quite evenly with an almost identical thickness. 2. A diatomite from Auvergne shows lamination (see Figure 5). Reduced to its elementary particles it was calibrated by a cyclone and particles of at least 80 microns were selected. Examination by microscope confirmed that the majority of the diatoms were unbroken. The larger particles were coloured with methylene blue and then mixed with the smaller particles. Figure 5. Sample of layered diatomite. The mixture was fed from the distributor into the test tube of water at three successive speeds of 50, 100 and 150g per hour for identical periods of time. Lamination appeared in the deposit and the thickness did not vary with the sedimentation speed. The original lamination was reproduced with virtually the same thickness (see Figure 6). Figure 6. Laminations resulting from the resedimentation of the diatomite. A plate measuring 80 cm by 25 cm by 40 cm was fixed at one end of a flume, just at the water level. It received a horizontal current of water at a slow speed. Coming from the flume through a circulation pump, and at the same time the diatomite particles were falling at a speed of 80 g per hour. The experiment was continuous for 15 days, apart from one interruption. Thin laminated superposed layers expanding laterally in the direction of the current were observed (see Figure 7). They could be distinguished from each other by a gradation of colours, which were clearly due to the different loads of large coloured particles. Figure 7. Lamination resulting from a lateral water flow. The continuous deposit of a heterogranular sediment in still water was studied. It was noted that the deposited material organised itself immediately after deposition into periodic graded laminae giving the appearance of successive beds. One of the more striking features of these laminae formed in the sediment itself was their regular periodicity. The thickness of the laminae was measured in millimetres. It was independent of the speed of sedimentation and varied according to the extreme difference in the size of the mixed particles. When deposition took place in a water flow, the lamination phenomenon was also observed. The geometry of lamination was modified by the water flow, but the latter was not the cause of the modification. The periodic graded laminae were similar to the laminae or varves observed in nature which are interpreted as a superposition of seasonal or annual beds. Their origin, however, was quite different, arising from periodic structuring after deposition. The question now is to study a number of laminated or varved formations in relation to this mechanism, particularly looking for physical structuring obtained from experimentation. Lombard. A.. 1972. Series sédimentaires—Genèse—Evolution. Masson et Cie-Edit. Paris. p. 147. Ref. 1. p.248. Return to text. Campbell. H. and Bauer. W.C., 1966. Chemical Engineering 73:179–185. Return to text. Gall, J.C.,1971. Mem. Serv. Carte geol. Als. Lorr. 34:126–128. Return to text. . This piece of original research was presented to the French Academy of Sciences in Paris on November 3, 1986, and was subsequently published in the Academy’s proceedings—C.R. Acad.Sc.Paris, t. 303, Série II(17):1569–1574, 1986. We are grateful for permission from Guy Berthault to publish this English translation.